Making my own laundry detergent is another way I'm trying to stretch our budget! I've made a basic, homemade laundry detergent in powder-form in the past, but I am loving this liquid version (more like liquidy-gel) so much more! Plus, the antimicrobial qualities of tea-tree oil is a definite added bonus. Heat 4 cups of water on stove with grated Fels Naptha. Stir and let it dissolve. Fill large bucket 3/4 way full with water. Pour in the water with Fels Naptha. Stir in washing soda and Borax. Cover bucket with towel and let it sit for a few hours or overnight. Add tea tree oil and stir. It always helps to have a little helper! 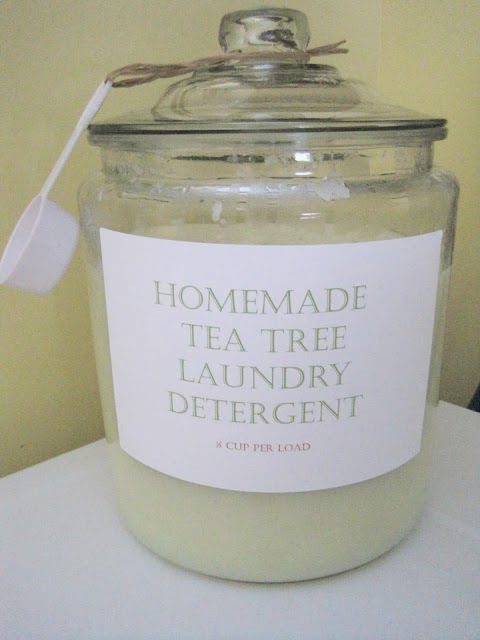 This is by far my favorite homemade laundry detergent so far. It makes our clothes smell wonderful and they come out very clean! We have a high-efficiency front load wash machine. I use a 1/2 Cup of detergent per load. Does his work in a front load washer?